It took until the six-minute mark of the third period before either the Niagara Falls PowerHawks or the Jersey Shore Wildcats were able to break the scoreless tie. Unfortunately for the hometown PowerHawks, it was the first of a pair of goals the Wildcats scored in the period on the way to a 2-0 victory Sunday afternoon. Antonio Filippello slid one past Hunter Norris at 6:37 of the period to give the Wildcats a lead late in the game. He was assisted by Adam Colclough. Hunter Johnson widened the gap to 2-0 on a shorthanded breakaway. PowerHawks’ forward Frankie Bodami did everything he could to break up the play on the odd man rush. Nick Anastasia, in his second start of the weekend for Jersey Shore, stopped all 32 shots thrown at him by Niagara Falls. Meanwhile, Hunter Norris turned away 26 of 28 shots in his first start of the season for the PowerHawks. 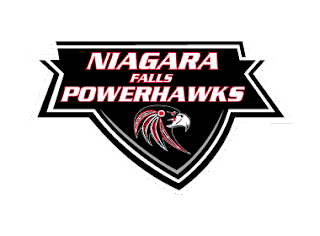 Niagara Falls will head to New Jersey for a pair of games against the Skylands Kings on Saturday and Sunday. The next home game for the PowerHawks will be Sunday, October 1st, at 1:00pm against the Roc City Royals. All home games can be heard LIVE on niagaraswatercooler.com.